One of the oft repeated truisms of ebook publishing is the importance of cover art. In terms of marketing, having an eye-catching, clever, beautiful, or arresting image gives potential readers (i.e., buyers) pause. My first novel’s (Dead Men Tell No Lies) cover received high praise from many sources, in part because the image itself began as an original self-portrait. Which is to say, a stand-alone piece of art. Despite not matching any particular scene or character within the story, the image evoked a sense of feminine torture, paralleling elements of my main female character’s story arc. With Volume II of the series, the wonderfully talented Cassandra Melena created a portraiture specifically for the novel (as with the map creation project for my fantasy world, I am fortunate to know such skilled artists). 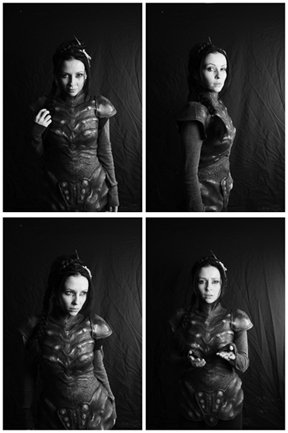 For example, the armor on the cover is a real prop, as is the make-up and remaining costuming. But, the title of this post is “The Art of Cover Art.” I thought it might be interesting to peek inside our process a little. First, I read a scene I wished to capture to Cassandra. If being forced to watch America’s Top Model has taught me anything (and, to be fair, it might not have), it’s that models need to find an emotional connection with their product. She and I bandied about visual concepts, such as the character’s in-story glowing eyes or crackling silver energy when using magic, but chose to keep the final product simple. Pictures lose so much when you cannot see the subject’s eyes, especially when your model’s almond eyes are so spectacular. At my direction, you can see her testing the use of supplicated hands, profile changes, and differing levels of sadness versus confidence. Several strong, quality shots gave us the opportunity to display multiple emotions in a single picture. More than I could hope for, really. Below you can see the final cover. 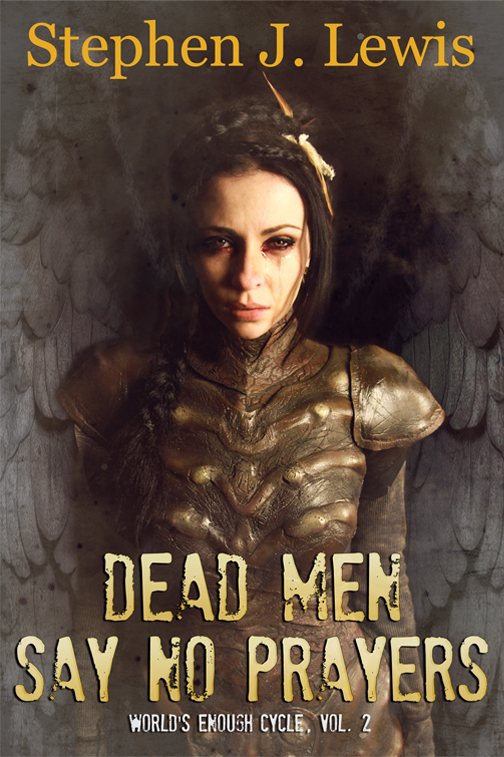 Dead Men Say No Prayers will be available through Amazon and Smashwords in a few days (or however long it takes me to finish the formatting). This entry was posted in Books, Characters, Photography, Publishing, Writing by sjl. Bookmark the permalink. I love it! Such a great cover, can not wait to read the second book! Another great cover. I love the theme you’re developing for the “metadata” for these novels.